Easy Listening; Electronica; Latin; Power Pop; Reggae; World; Urban/R&B; Rock; Ska/ Reggae-fusion. Norma Fraser is known for her songwriting styles; catchy melodies, clever lyrics as well as her energetic live shows. Her music is a blend of Pop, Rock, Reggae, Worldbeat, R&B, and techno rhythms..truly a nice “mixx” of Power-Pop and Reggae at its best. Songwriting with the vocal “chops” to match characterize her mesmerizing musical effect on her listeners. She has been featured on Heartbeat Records (USA) and Soul Jazz Records(UK) compilations to high acclaims. 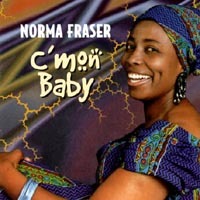 Norma Fraser is the original singer of the International Reggae Hit, “The First Cut Is The Deepest.” Jamaican born with a M.A. degree, she recorded for “Studio One,” the legendary Jamaican Reggae Label and worked with label mates, Bob Marley, Jackie Mittoo and other foundation artists. She has her own Indie label and produced, arranged and composed the music for this latest release, “ONE MORE CHANCE.” An exciting and high-energy album….a true gem. was happy to find this cd. it was hard to find in stores. thanks cd baby! !Norma never sounded better, a beautiful voice. Uplifting music.